In embroidery terms, digitizing is the process of converting artwork into a digital code that can be read by the embroidery machine. The process of digitization is not as simple as just scanning your artwork. The file containing a digital image of your emblem or logo that you view on a computer screen is very different from the "digitized" file used by an embroidery machine. Think of the digitized file as a map showing the place and color of thread for every stitch. 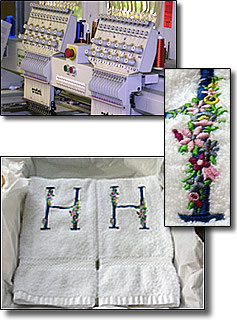 It tells the machine where to start and end each color, as well as the order of the colors and the type of stitch to use. The more complex the artwork, the more involved and costly it is to digitize. As you can imagine, the quality of digitizing plays a major role in how a design looks in the end. SuperStitchin offers quality digitizing at very reasonable prices. Often we digitize simple designs for a minimal charge. For more intricate designs, our prices are based on their size and complexity. If you would like to know more about digitizing, or have questions on whether we can use your current designs or logos, please contact us.